France has denied it made a secret pact with Iran to secure the release of a French lecturer charged with spying after last June's disputed election. Clotilde Reiss has now arrived in Paris following a flight from Tehran. 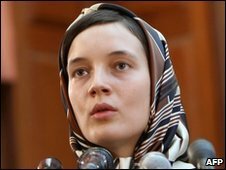 She was originally sentenced to 10 years in jail in Iran but this was commuted to a fine of $285,000 (£190,000), her lawyer said. The 25-year-old was accused of espionage and e-mailing photographs of anti-government protests. Foreign Minister Bernard Kouchner told Radio J in France that there had been "no haggling and no pay-off" to secure her release. Ms Reiss is due to meet French President Nicolas Sarkozy on Sunday. Ms Reiss's lawyer, Mohammad Ali Mahdavi, earlier said he had paid the fine on her behalf. She has been staying at the French embassy in the capital Tehran since she was bailed six weeks after her arrest in July last year. At that time, Ms Reiss had been on a six-month teaching and research assignment in the central city of Isfahan. The BBC's Hugh Schofield in the French capital says that with France at the forefront of efforts to punish Iran for its nuclear programme, there has been suspicion she was being held to put pressure on Paris. Last week, France freed an Iranian engineer whom it had detained for the alleged illegal export of electronic parts for use by Iran's military. The US had wanted to extradite Majid Kakavand, but a French court rejected the request last week and he was allowed return home.